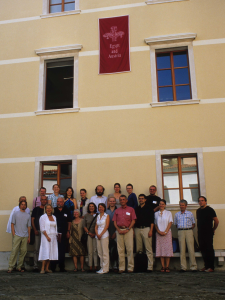 The 2008 meeting of our group was held at the picturesquely place of Piran (Slovenia) as a vividly signal of the extended cooperation between the Czech, Austrian, and now the new Slovenian group as well. I. Lazar & T. Kajfež: Egipt in Austria V. Mednarodni simpozij, Piran, 8.-10. septembra 2008. in: ARGO. Journal of the Slovene Museums 51/2 (2008), 111-114. I. Lazar & T. Kajfež: Egypt & Austria V. Mednarodni simpozij, Piran, 8.-10. september 2008. in: Annales for Istrian and Mediterannean Studies. Series Historia et Sociologia 18, 2 (2008), 493-495. See here. There are some additional figures for the conference paper Tradition und Interpretation. Die altägyptische Religion in der Sicht des 18. Jahrhunderts in Europa [Tradition and Interpretation. Ancient Egyptian Religion in the Eyes of the 18th Century Europe] by Konrad Antonicek on our website; please see here.